It would be interesting to know why this semi-circular wall is called the “Monkey Stand”. The name appears in a heritage leaflet published by the Kirby, Great Broughton and Ingleby Greenhow Local History Group. 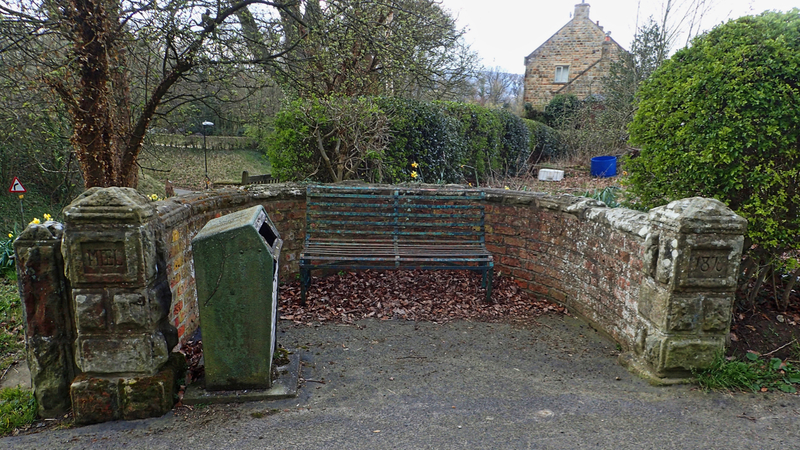 It’s probably on the site of the village pump although it is not one of the several wells, springs and troughs that were shown on the 1853 Ordnance Survey map. Two sandstone pillars finish off the ends of the wall, one inscribed “MIEL”, the other “1878”. Another mystery. The scene is spoilt somewhat by the ugly litter bin. Incidentally, Ingleby Greenhow now has just the one pub, the Dudley Arms, but the 1853 map shows two, the Fox and Hounds and the Shoulder of Mutton.